This stunning piece of late mid-century modern German engineering, the iconic Grundig SO 191, recently came through the shop. It’s owner picked it up from an antique shop in nearly pristine cosmetic condition, but with a few electrical issues to sort out. It’d power on, but wouldn’t play! That’s definitely a problem, and so it was time for a full overhaul. Other than a stain at the bottom of the grille cloth, this console was immaculate. It’s a massive, powerful, top-of-the-line console from the era: a total of 16 tubes, AM/FM/Shortwave and a powerful stereo amplifier with push-pull EL95s per channel driving three high-efficiency drivers, two forward-firing and one side-firing per channel for a total of six speakers. It’s so powerful, it’s split up onto two chassis! The amplifier module itself is well regarded in audiophile circles and can command several hundred dollars on the secondary market. It’s paired with the tuner unit with a magic eye tuning indicator and the rest of the circuitry. The technology also really shows the era this was made in: while it has a very sensitive and high fidelity FM tuner, and the amplifier itself is stereo, there’s only true stereo output possible from a turntable or reel-to-reel: the FM tuner lacks an onboard de-multiplexer and has no provisions for an external one. When this console was manufactured, FM Stereo had only just barely been invented and wasn’t fully standardized yet. It’s unfortunate, but even still, it sounds great in dual-mono when fixed up! Underneath, six coupling capacitors had been replaced with new film caps sometime in the ’90s, but the rest was all original. And the cause of the lack of output was very apparent: one lead of a power resistor in the B+ path was broken off, depriving most of the tubes of their power. That’s no good! A full re-cap of the amplifier, including Nichicon electrolytic capacitors in the signal path and KXG-series electrolytic capacitors in the power supply for extra long life. I tested the forward and reverse resistance of the selenium rectifiers and they were within spec, so I left them in place. There’s a very large selenium bridge in a can on top of the chassis, and a single-plate selenium rectifier for the bias supply. 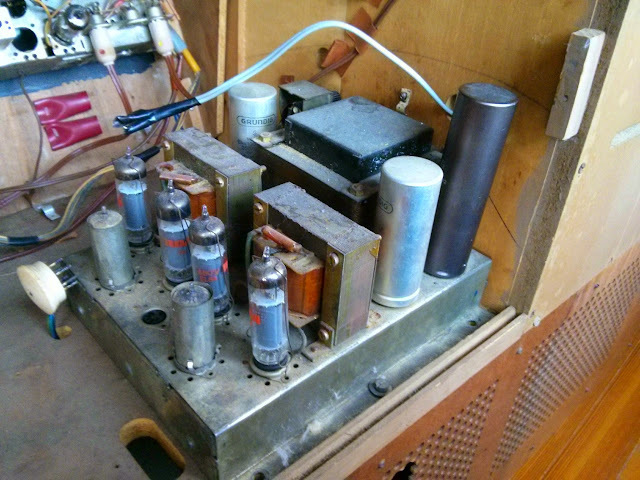 Up in the tuner section, it’s cramped as German radios often are – but with the amplifier and power supply on a separate chassis, it was surprisingly workable! I spot-checked resistors for tolerance as I passed them and every one I measured was within specification, as has been the case on nearly every German radio I’ve serviced. They sure built them to last! After component replacement, it was time for a first power-up. Not bad – but not great, either. There were a few issues. First was the power switch: the switch mechanism itself was damaged, somehow, and would never energize. Cleaning didn’t help and the switch was buried deep in the mechanism so the owner opted to bypass it and install a new switch on the power cord. Finally, the multiband tone control had an issue. Most of the bands worked, but the final treble adjustment which worked by pushing on a cable via mechanical linkage to change the bandwidth of the final IF transformer was nonfunctional. The cable was seized inside its housing, and cleaning and lubrication from both ends weren’t sufficient to fix it. The risk of permanent, functionality-killing damage was too great to overcome so we decided to leave that as-is. “Normal” through “Decreased” worked, but a treble increase wasn’t available after this fix. Then, an alignment, and ready to go home! This radio is truly a marvel of high-end German engineering and with this service, it wouldn’t surprise me to have it last another 50 years. It’s a lot of work (and a fair bit of money!) to bring one of these back to life but it’s well worth it in the warm yet commanding sound they produce. 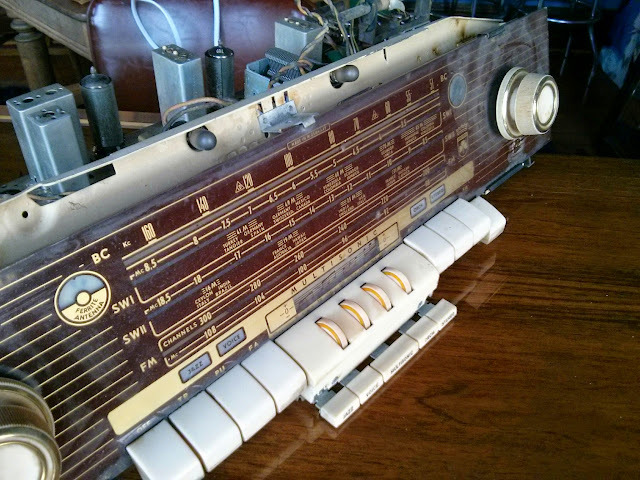 If you need your vintage radio serviced, Rain City Audio can help! 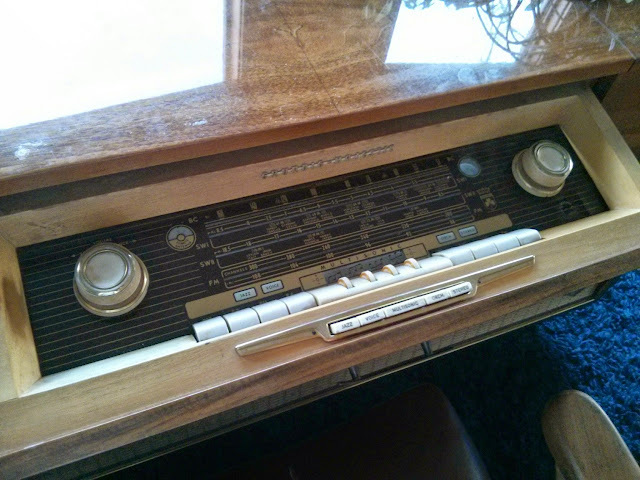 This entry was posted in Audio, Hi-Fi, Projects, Vintage and tagged german radio, Grundig, hi-fi, so 191, stereo console, vintage radio. Bookmark the permalink. I really appreciate it. I would love to get this running in honor of my father. He was so proud of this thing. I also have a bunch of reel-to-reels that I know my family recorded on probably before I was born. I know he had the microphone and I remember hearing stories about them recording reel-to-reels. I would love to hear them. I would assume the reel-to-reel and turntable are a whole nother animal. If I recall, their belt driven. Have you ever dug into either on this model and if somebody’s fairly mechanically inclined how are they? Primarily belt cleaning and lube? I noticed that you installed the amp section 180* from the way it came out. Is there a reason for that? 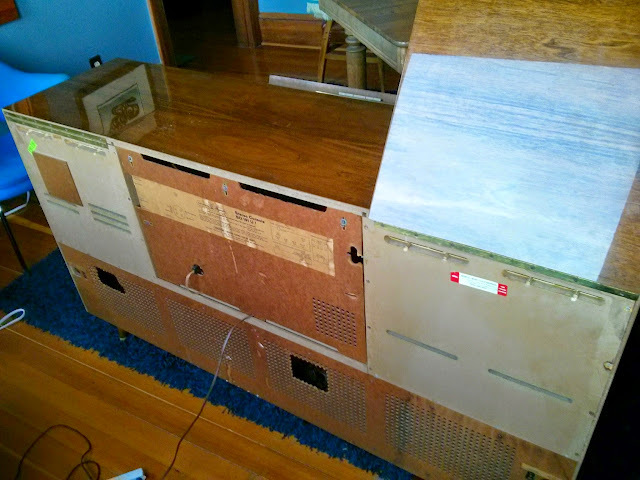 I’ve got this exact unit (the …-US model) and looking to get it recapped or recap it myself. We powered it up when we got it home and I believe everything worked and it sure sounded great but it’s got all the original paper caps. Any idea where can I get a schematic that’s in English? Also, how best to get it recapped? I’m confident in my soldering skills, but not in my “this 1962 German capacitor needs to be replaced with this 2017 one” diagnosing ability. Any idea what it would cost to have the amp and the tuner recapped by a pro? The FM antenna also has some damage and I don’t believe it to be repairable but I’m ok with replacing it or upgrading it. I’m in central Vermont, and would love any input or guidance you have. Thanks much. Excited to get this thing back up and running and in the living room for the missus. I sent you an email with the schematics. If you don’t receive it email me at Septaric@yahoo.com. Good luck. Thanks for the detailed photos. I would say that one’s a goner, unfortunately. It looks like one output transformer has been destroyed and there was a serious short circuit in the past. It’s very tough to find replacement parts for those. Sorry for the bad news! Thank you so much for taking a look. I thought it was a lost cause when I saw the burn marks among other things, so not a big surprise. I’ll see if I can part it out. I really appreciate your time. 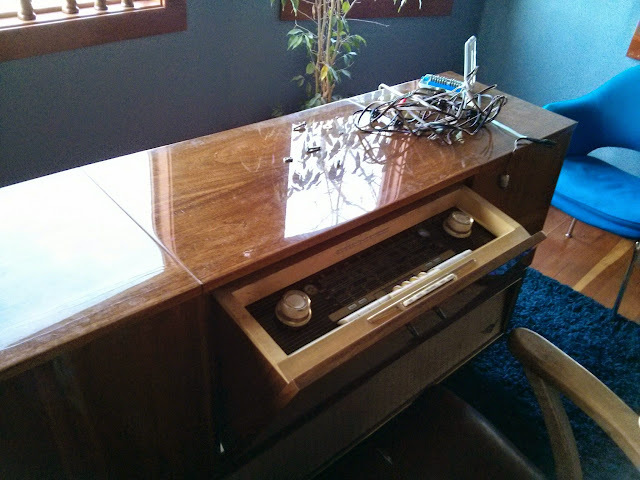 I have a 1959 or 1960 Grundig SO-191-PX console. The amplifier module looks exactly the same as the one in these pictures. 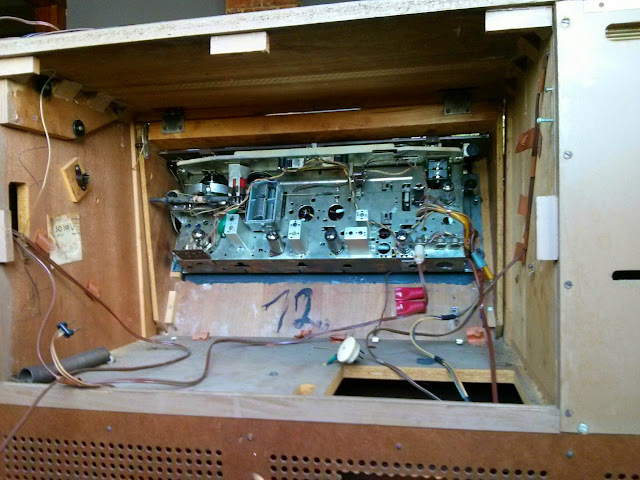 Do you know what the model number was for the amp in the SO191 console you repaired? I’m trying to locate the schematic. The SO 191 schematic is all you need, it has all the information. Thank you for the info about the schematic. I have now removed the amp and can see some obvious problems. Such as loose or missing wires/parts and burn marks. There were also some previous modifications done in England during the late 1970’s. If I sent you a couple of pictures of the amp, would you be able to tell me what may be involved in trying to fix it? Upload them to imgur.com and post the links here and I’ll take a look. hi, I have a Grundig MR200-2 plus a MCR100 tape deck. The MR200-2 needs repairs either the semi conductor or the potentiometer. Is this a simple task and is it wrth repairing. I was hoping to some information on the Grundig that my grand parents left me. All i know is that it is from the 1950s. It has a record player on one side and a reel to reel on the other. Two cabinets, one on each side. One side is like a mini bar and the other has an old mic and felt brush. Any info you could provide would be appreciated. I can send pictures if need be. Hi Shane, do you have a photo or anything? I do know the ones with the minibar are extremely rare, but there were a few possible models that could have been in that configuration. 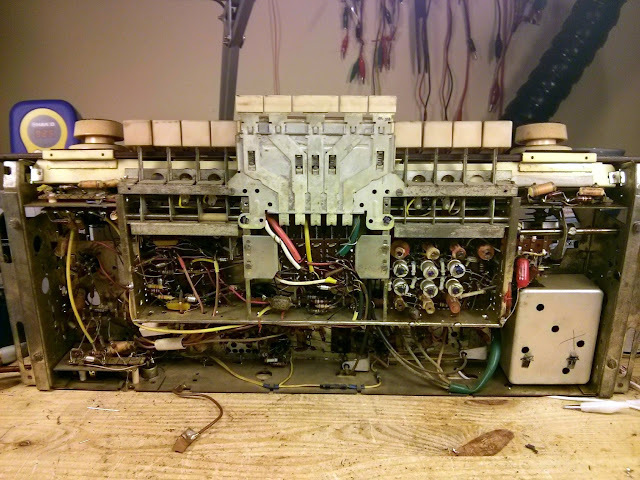 What would most likely cause a blown fuses in Grundig 2066 ,1958 Shortwave radio? Fuses are almost always a B+ short. Filter capacitors are my first guess; coupling cap from the previous stage to the input grid on the power output tubes, causing the tubes to draw excessive current, would be my second guess. Great job. I am sure it sounds fantastic.